Welcome to the final round of “Cookies I Bought At Jungle Jim’s International Market.” Hey…cookies are awesome and when I find cookies that I have never spotted in my area of the country…I take every opportunity to try them. I mean, come on, cookies are the perfect treat after a long day. A little savory…but also sweet. You can’t go wrong. While shopping in the gluten-free section of Jungle Jim’s International Market on my birthday, Cathy spotted a small line-up of little macaroon-type cookies. I used to despise coconut. I thought it tasted like having bugs in your mouth. Texture-wise…a fail. That being said, as I’ve gotten older, the more times I try coconut, the more I have come to enjoy it…in certain forms. One of such forms is in…macaroons…those sweet lumps of toasted coconut with that golden crust at the bottom. Yep…I devour those now. Go figure. They are just a nice, healthier cookie to indulge in every now and again. So, imagine my excitement when Cathy spotted a shelf with little pouches of macaroon cookies called Coco-Roons. I knew I wanted to try one of the different varieties…but I had to narrow it down to the one that interested me most. Coco-Roons are made by the company Wonderfully Raw. Wonderfully Raw was started by Sequoia Cheney, who had a passion for good food that wasn’t exactly good for her. When she was diagnosed with type 2 diabetes, she knew something had to change in order for her to heal herself. She decided to change her path and began a journey into good health. Her son, Eric Hara, a renowned chef in New York City, gave her a lot of inspiration and encouragement. So Sequoia decided to create delicious food that was also good for her. She began to train at Living Light Culinary Institute in Mendocino, California, where she trained with the best raw food chefs in the business. And with what she learned there, she could now prepare food that could support and heal the body. This dynamic mother and son duo have come together to create Coco-Roons, which are produced using only the finest organic ingredients. Perfect segue here to tell you what is actually in these miniature cookies of wonderful lemony goodness, yes? The Wonderfully Rw Lemon Pie Mini Coco-Roons are made from organic dried unsweetened coconut, organic almond flour, organic unfiltered maple syrup, organic cold-pressed coconut oil, organic lemon zest, organic vanilla extract, and Himalayan crystal salt. That’s it, my dear readers. That’s it. These miniature macroons are vegan, gluten-free, and paleo (if cavemen ate desserts…and I’m still not convinced that’s true). These are also raw and certified non-GMO. As far as nutrition goes, the Wonderfully Raw Lemon Pie Mini Coco-Roons are a fantastic treat at the end of the day. A serving size is 3 of the miniature cookies. There are 2-4 servings per bag, as I think they actually go off weight. One serving will provide you with 80 calories, 6 grams fat, 3 grams saturated fat (from coconut oil), 0 grams trans fat, 0 mg cholesterol, 30 mg sodium, 6 grams carbohydrates, 1 gram fiber, 4 grams sugars, and 1 gram protein. Not filling, but not horrible by any standard when it comes to a treat. And since this is kind of out of my usual order, how about I tell you how much I LOVE these cookies, yes? First of all, they don’t taste coconutty at all. Nope. You get a bit of the texture, but that fresh lemon flavor is what tempts your taste buds into popping the next one. These cookies are tiny, little bite-size mounds of goodness. I was sad to only eat three of them tonight. I mean, totally amazing flavor…and you can’t beat how good these are for you…as fr as cookies go. I love that these are sweetened with maple syrup instead of granulated white sugar. And I love that I don’t feel bad just digging into these. If you’re a lemon lover…these will definitely make you happy. My roommate got to her serving first and all I heard was, “These are amazing.” And…she was absolutely right. 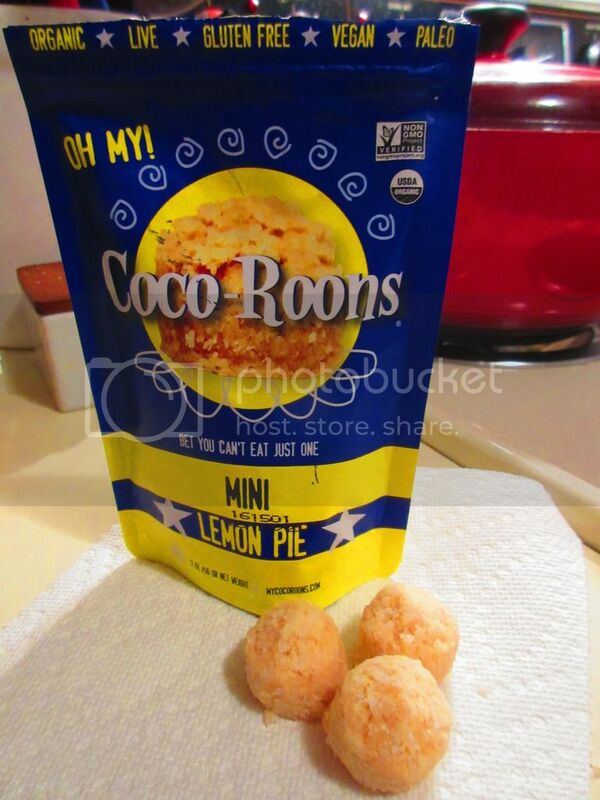 I have a new soft spot in my heart for the Wonderfully Raw Lemon Pie Mini Coco-Roons. I hope a store around here carries them, otherwise I’ll be scooping up more of these and the other flavors on my next trip to Jungle Jim’s. And, if nothing else, they are available to order online on the Wonderfully Raw Web site. Beyond enthusiastic and happy with these cookies for sure. I loved these from first bite and simply can’t wait to dig in tomorrow for more. 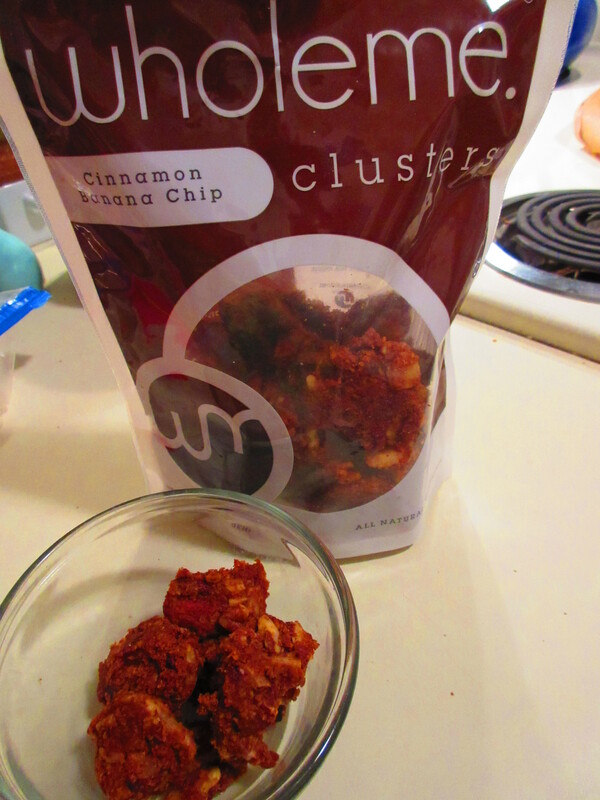 Here’s a no-guilt, fantastic, healthy dessert or snack you’ll love. Trust me. Sometimes trying to find balance in your diet isn’t easy. There are some days my macro and micro nutrients are so out of whack that I have a hard time seeing where things went awry. That being said…I am always looking for new and inventive ways to have a food that I love, minus the guilt and the excess. Enter Cuisine Cube! For those of you just tuning in, I have been a firm supporter and happy subscriber of Cuisine Cube for awhile now. But, Cuisine Cube has gone through some changes as of May. No longer do they strictly only offer gluten-free cubes. In addition to their gluten-free option, they now also offer Artisan and Vegan cubes as well. The Artisan cube means that you have no food allergies and foods that contain common food allergens will be included. The Vegan cubes contain products that are dairy and animal free. And, they still have the Gluten Free cubes, which will have products that contain no gluten or wheat. These box subscriptions start at $34.99/month. And, part of the charm is that you will receive 5-6 full-size (not sample size) products. WOOT! These usually fall into every meal category for the day: breakfast, lunch, dinner, snack and dessert…with an added bonus from time-to-time. So, if you’re really interested in being introduced to the smaller, lesser-known, artisan companies, give Cuisine Cube a try! So, when my February 2015 (Happy V-Day) Cuisine Cube arrived, I was happy, excited, elated, and over-the-moon happy to find an easy-to-prepare (not that the real thing is difficult, but this was certainly less time consuming) Cauliflower Mash from Zero Cuisine. Now, I have heard and even made cauliflower mash before, but this was the first time I ever saw it come in packaged form. I was beyond intrigued. And yet, the perfect moment to use it never quite arrived…until just recently when I spotted a recipe for Portobella Mushroom Steaks. What goes best with a steak (of sorts) than potatoes. 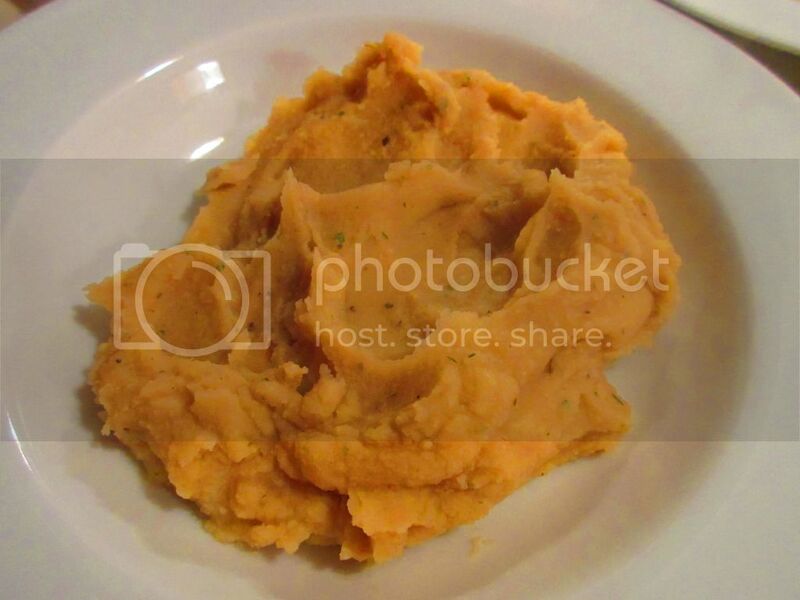 So, why not replace the mashed potatoes with something a bit healthier and lower in calories and carbohydrates? It was ideal. Zero Cuisine brings you a leaner, better-looking cousin of the traditional mashed potato. Their Cauliflower Mash, available in two flavors – Garlic, Herbs & Sea Salt and Wasabi & Chives – is a low carb, low calorie, low GI, gluten-free, preservative-free, high fiber, high in vitamins, all natural product that can easily replace your favorite starchy carbs with low carb vegetables which just about every diet recommends. From the Ketogenic, Atkins, Paleo, diabetic diets…reducing carbohydrate intake is highly touted. Zero Cuisine…just makes it easier for you to enjoy a substitute for starchy carbs without any guilt or any cravings for the carb-laden real thing. Cuisine Cube included the Garlic, Herbs & Sea Salt version in the February cube. But, how good can a powdered form of cauliflower mash be? Well…just as good, but healthier for you, than those powdered potato flakes that turn into mashed potatoes. Honestly. I had my doubts upon opening up this little package, but it was so quick, easy, and really tasty when all was said and done. In a saucepan, heat up water (4 ounces per serving, so if you make the entire thing like I did…2 cups of water) and bring it to a boil. 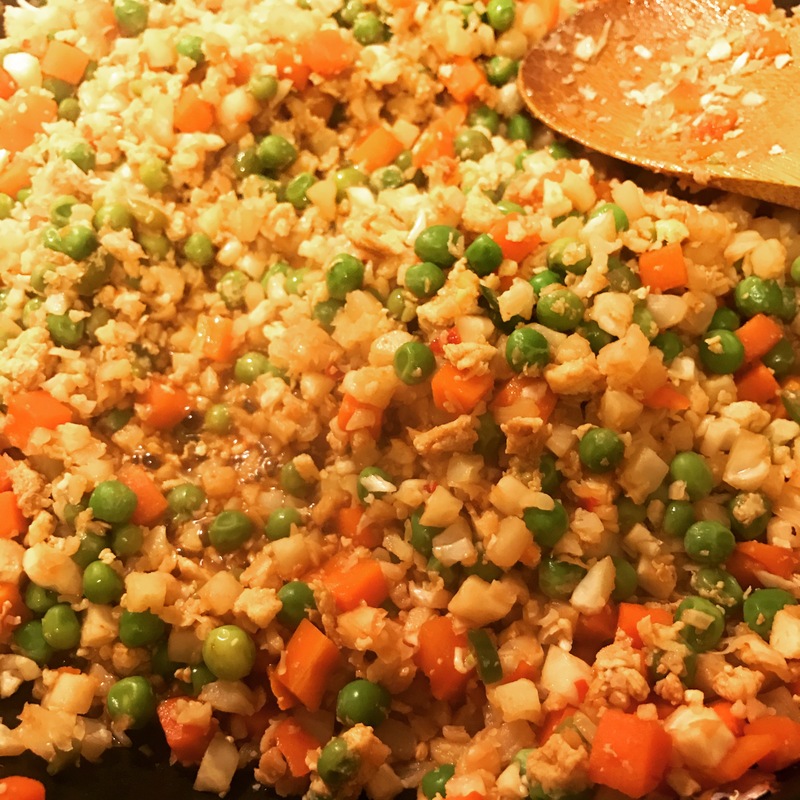 Reduce heat and add 1/3 cup of the Cauliflower Mash powder (or…if you make the entire pouch instead of one serving…just pour the entire package) into the hot water. Stir continuously until desired consistency is achieved, which for me was in less than 3 minutes. Might have only taken a minute. For extra creamy flavor, add butter and milk if your diet allows. I didn’t add butter or milk, but I did get a beautiful, rich, thick cauliflower mash when all was said and done. It was like really creamy mashed potatoes. Great consistency. Of course, the biggest test comes with the taste. Zero Cuisine does a phenomenal job of capturing the texture of mashed potatoes with their Garlic, Herbs & Sea Salt Cauliflower Mash. 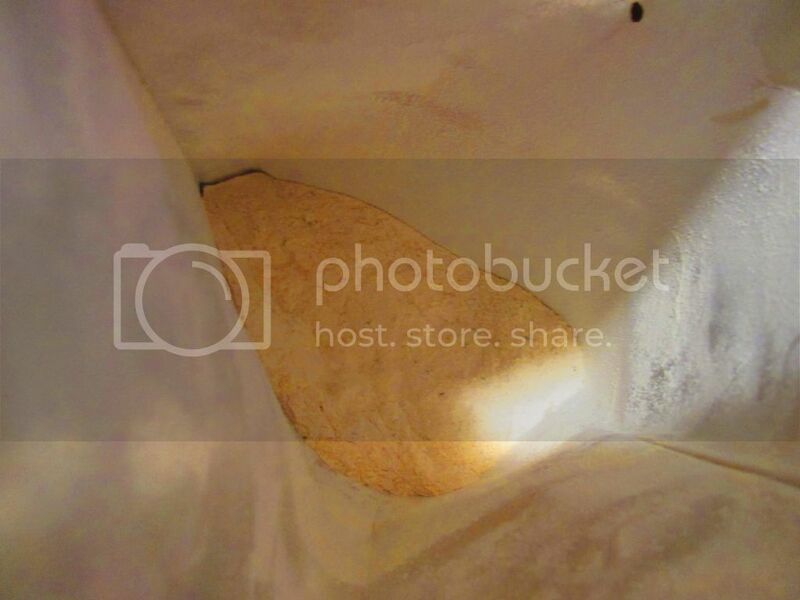 I was actually quite impressed as I watched the powder turn into this gorgeous swirl of thick mash. And, with only a lack of a bit of seasoning, the flavors really stood out too. The garlic and herbs don’t overpower the cauliflower itself. It just would have been a bit bland if not for the seasoned portobello mushroom steak I was serving, which came with a sauce that I drizzled over the entire dish. It was an amazing addition to the meal and took a lot of prep time out of the occasion. It’s always best to make things yourself, but this is a healthy and very easy alternative when time restrictions play a huge part in your life. Let’s talk about ingredients, shall we? The Zero Cuisine Garlic, Herbs & Sea Salt Cauliflower Mash is made up of dried cauliflower, garlic and spices, sea salt, and guar gum. It is naturally gluten-free, trans fat free, free of saturated fat, and cholesterol free. Gotta love it. Also, every pack of this cauliflower mash is made from approximately 2.6 pounds of fresh cauliflower and every serving of Zero Cuisine Cauliflower Mash contains 1-1/2 servings of vegetables. As far as nutrition information goes…you’re going to love this even more. A serving size is 1/3 cup package or 2/3 cup prepared. There are 4 servings per container. In one serving, you will be consuming 60 calories, 0.5 grams fat, 0 mg cholesterol, 270 mg sodium, 15 grams carbohydrates, 5 grams fiber, 10 grams sugars, and 3 grams protein. This is spectacular given that a regular serving of mashed potatoes would provide 160 calories, 24 grams carbs, 6 grams of fat, 2 grams of fiber, and 445 mg sodium HUGE difference. Feel good about your food. Eat something that is better for you and your body in the long run. 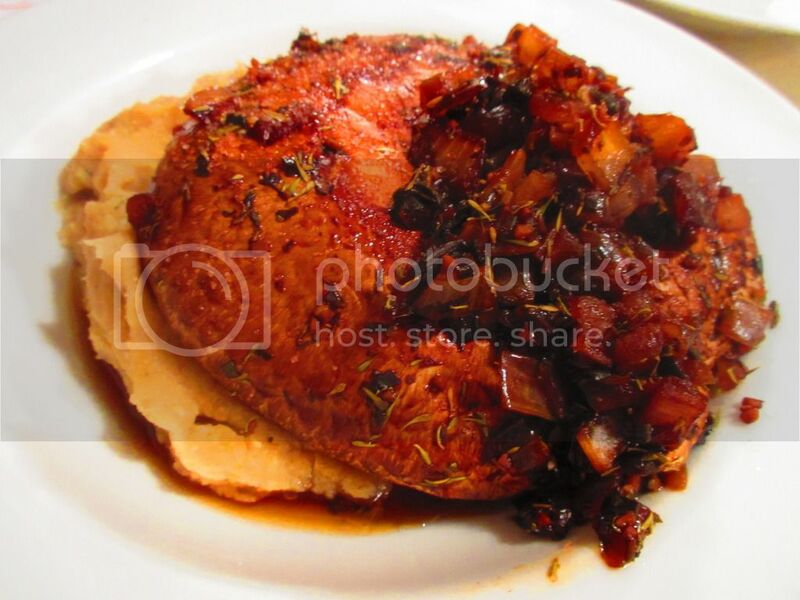 I need to find out where I can find this in my area, because Zero Cuisine made prep and cooking so easy. Especially on hectic nights, this is something that is worth having in the pantry. 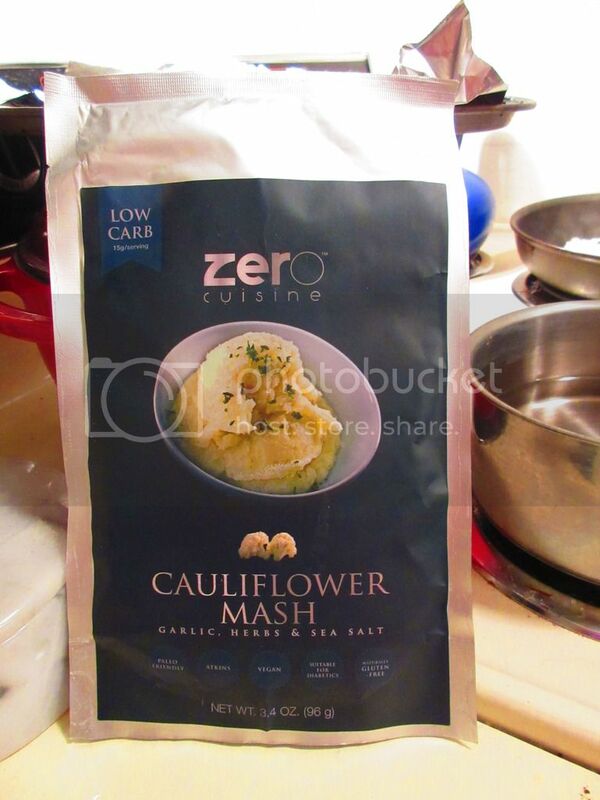 Loved the flavors and the texture of the Zero Cuisine Garlic, Herbs & Sea Salt Cauliflower Mash. And it was because of Cuisine Cube, that I now know it exists. Happiness comes in all sorts of packages! When a product goes by the name “Laughing Giraffe” I take notice. Funny thing though…I’d never heard of this brand before. Trust me…if I had, it would probably have already been a staple in my pantry. This brand and product came to me courtesy of my monthly subscription to Cuisine Cube. I know most of you, by now, are familiar with this service, but let me give you a quick rundown. For as little as $29.99/month, you can have Cuisine Cube delivered to your door . What this service provides is 5-6 gluten-free, full-size products that are made by local and smaller, artisan companies, rather than those that you can find at the average grocery store. It has introduced me to so many new and delightful products. Each box contains a breakfast, lunch, dinner, snack, and dessert product…and then, sometimes, an extra bonus item. Who doesn’t love a little something extra, right? So, April 2015’s Cuisine Cube featured Laughing Giraffe Organics Cherry Ginger Snakarola for the Breakfast/Snack item. I was immediately intrigued. Loved the name of the company and the name of the product. And I love a good granola…and this looked like it was quality in a little pouch. So, yeah…excitement. Laughing Giraffe Organics is a family run business owned by the Gilmour family, based out of the San Francisco Bay Area. They entered the health food business out of a desire to learn about healthy eating and how it could improve their own well-being. Laughing Giraffe Organics mission is to provide quality nutritional snack foods that taste great and only use the purest organic ingredients that are nutrient dense and minimally processed. I am loving this already. Basically, they make foods that they believe will satisfy hunger without detracting from quality of life. This is a company that truly wants you to eat well and live better. Who can’t get on board with that, right? It was my 5:30 a.m. spin class day at the gym yesterday. I love my class, but it’s an hour long, and I have to go home, shower, and get everything together to get out the door to work. It makes for a huge time crunch. SO…in order to have something my roommate can eat and that I can take with me to work, it is often something like a Greek yogurt parfait or something of the sort. This was the case this past Wednesday, and so, before heading off to the gym, I made up two bowls of my infamous breakfast parfaits…Greek yogurt, granola, and fresh berries. I try to keep healthy (ie: low sugar) granola in the house, and since Cuisine Cube had provided me with some, I figured I’d take full advantage on such a chaotic morning. I washed the berries and prepped the to-go bowl and the nice bowl (for the roomie to eat at home) for the actual assembly of the parfaits. I put a small handful of the granola in each bowl, then spooned over the Greek yogurt, then added the berries. Repeat. Then finish off with another handful of granola. It’s a filling, amazing, delicious and nutritious way to start the morning. Of course, I had to try this granola on it’s own, as well as as a mixer with the parfait. 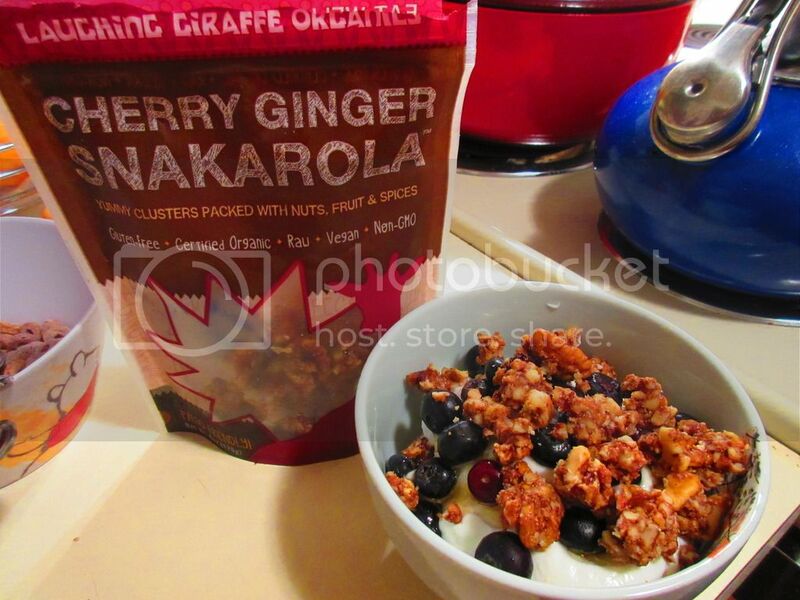 The Laughing Giraffe Organics Cherry Ginger Snakarola is a better granola. It’s soft (like Van’s Granola), and packed with nuts and and tons of flavor. I was a bit concerned with the ginger in the name of the product, but the ginger that is included in the mix isn’t candied or overwhelming. It’s blended in perfectly and offset by the salty-crunchy nuts. Then…to add to the decadence…dried cherries. Honestly, it was a perfect blend for me. Almost like a muesli while still being a granola. It was amazing. And it could be used over dairy-free (or regular) ice cream, in cookies, or eaten straight out of the bag…among other tings. That’s the great thing about a fantastic granola…it can be so versatile. The Laughing Giraffe Cherry Ginger Snakarola is all of that. And…it’s addictive…in a good, healthy, and delicious way. So, let’s take a look at the simple, basic, organic ingredients that go into each pouch of Laughing Giraffe Cherry Ginger Snakarola, shall we? This granola is made up of organic walnuts, organic pecans, organic agave nectar, organic dried cherries, organic ginger powder, organic vanilla extract (gluten-free) and Himalayan pink salt. This product compliments a Paleo diet, has a low glycemic point, is nutrient-rich and power-packed, is a fantastic source of healthy fats, and is packed with fiber to keep you feeling full. This product is gluten-free, certified organic, raw, vegan and non-GMO. As for nutrition information, don’t be frightened. Remember much of this granola is made up of healthy nuts, which, are higher in calories and fats (but healthy…just keep to the serving size or below!). A serving of the Laughing Giraffe Cherry Ginger Snakarola is 1/2 cup. This serving will give you 290 calories and 25 grams of fat. You will also be taking in 50 mg sodium, 13 grams carbohydrates, 8 grams of sugars, 3 grams of fiber, and 8 grams of protein. This granola is cholesterol free. It was definitely love at first bite with this granola. It wasn’t too sweet, nor was it spicy. It was crunchy without being over toasted. And it was soft and delicious. Filled with the best sort of foods for healthy and fitness…yeah…this was a definite win. Now to get more for my pantry. Perhaps in another flavor. Thanks to both Laughing Giraffe Organics and Cuisine Cube for this fantastic product!